Healthy eating for healthy learning is the dictum followed at Scottish High. The School lays a great deal of emphasis on ensuring the health, hygiene and nutrition requirements of its students. 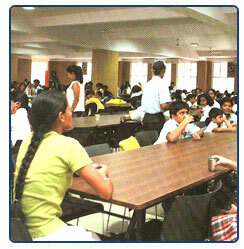 At breakfast, the students gather in the mammoth air-conditioned dining hall that can accommodate 1100 students at a time and have their first nourishment of the day. 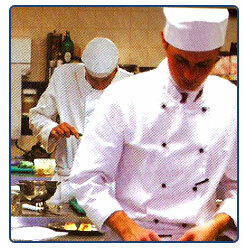 Highly experienced chefs prepare a variety of multi-cuisine dishes for the students in the ultramodern and hygienic kitchen, during their breakfast, lunch and evening milk. The menu of the school is supervised by a qualified dietician who approves the menu suggested by the food committee comprising of teachers, students, chef & core management team.The Food Committee meeting is held regularly. The agenda for the meeting is to collaborate, reflect and take feedback from various stakeholders of the school which is headed by Primary School Principal. Students are an integral part of the meeting and suggest an unprejudiced feedback of the meals served at school. The chef is suggested changes in the menu, if any. He too gives the administrative possibilities of the changes suggested. He also suggests any alterations in the menu on account of wastage and accessibility of various commodities. The doctor takes into account the nutritional standard of the meals served. The presence of the Estate Manager ensures that the opinions are taken and conclusions facilitated. The meeting also ensures that the applicable regulations are complied with, which include, sanitary rounds by the doctor, medical checks of the kitchen staff, raw material supply standards and sampling of food. 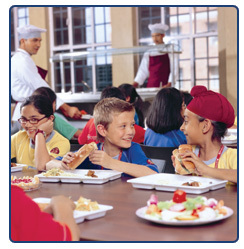 This periodic and cohesive contribution makes sure that the meals served at school fulfill all essential requirements. A full-time doctor in the school closely monitors the hygiene factor and the food is served by trained and efficient stewards. 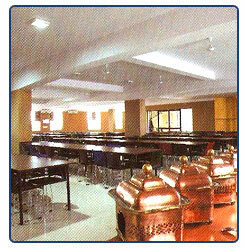 Entire teaching fraternity dines with students and the students’ eating habits and dining room etiquettes are supervised by the class teachers. Safe and purified water is made available for the students at all times. The mealtime in the school is indeed not a “break time”, but a sanctimonious ritual and an opportunity for students to pray together, break bread together & bond with their teachers and peers.